If you are planning to sell something online, preparing an ecommerce plan is the first step towards building an effective online store. Starting from website goals to your target audience, you need to consider different factors so as to determine how much time and money you require to build an ecommerce website that perfectly caters to your business needs. However, building an amazing website will not help you to maintain a consistent flow of traffic to your website. You need to continue with a multifaceted promotional strategy that is targeted towards your audience. 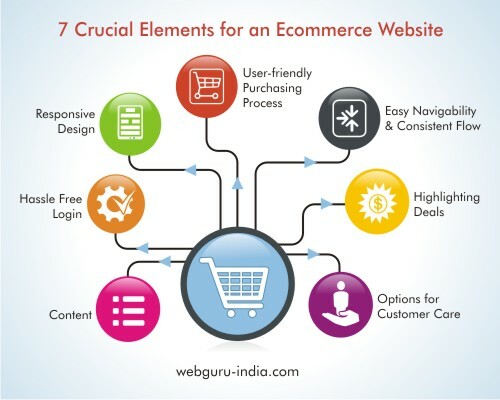 These are the 7 essential elements that you should consider while optimizing/developing an ecommerce website. It is the requirement of every website to provide users with an easy navigability so as to keep them interested and maintain an easy flow. It is important for you to make sure that visitors do not get confused with excessive information and unnecessary clutter on your site. It is always a good idea to maintain separate pages for various categories of products and/or services you are selling. The idea is to present the users with an enjoyable experience so that they make return visits to your website. The only way to connect your website visitors is through informative and fresh content. Apart from interesting images, provide your visitors with interesting information, easy ways to get in touch with you as well as incentives to make a purchase. Another vital thing for you to consider is to refresh the content of your website on a periodic basis. With search engine algorithms changing every now and then, it has become more than necessary to continuously update your website contents to gain better search engine rankings and earn more visitors. Often at times, it is observed that visitors hesitate to make a purchase simply because of the fact that they are not willing to register or create a new account. Thus, you should make it a point to offer your visitors with an easy login through various social media accounts like Facebook, Twitter, Google+, etc. by offering your website visitors with convenient login options you can drastically increase your chances of getting more sales. You must be well aware of the fact, how much important it is to have a responsive website these days. With the growing focus on mobile devices, people are now shifting towards making purchases from their smartphones and tablets instead of using desktops and laptops. Therefore, it is the need of the hour to provide users with a well-designed responsive web layout that helps them to make purchases even on the go. When a person wants to buy an item from your website, he/she would definitely not want to click on different options or fill out long forms so as to complete the entire process. A long purchasing process always turns out to be a put off driving potential sales opportunities away. You need to ensure that visitors are provided with a short and convenient purchasing process with equal focus on security so that they can shop freely and happily. People prefer shopping online not only because they get to buy their preferred products from the comforts of their home but, also to save money. Highlighting special offers, deals and promotions on the home page of your website is an effective way to make more sales. You may also showcase percent-off sales, freebies, discounted items and more to attract more visitors to your site. When visitors to your online ecommerce store are not able to find the product and/or service they are searching for, they immediately look for customer care options. Providing your website visitors only with an email address is simply not enough. Apart from including contact options through phone numbers, you should also offer access to different social media channels to submit complaints or for urgent queries. Focus on designing a web shop which is inspiring and appealing. Always try to give your website visitors the best possible experience so that they can make purchases confidently. Remember that easy usability is the key to success of your ecommerce website that will give your visitors enough reasons to come back again and again.